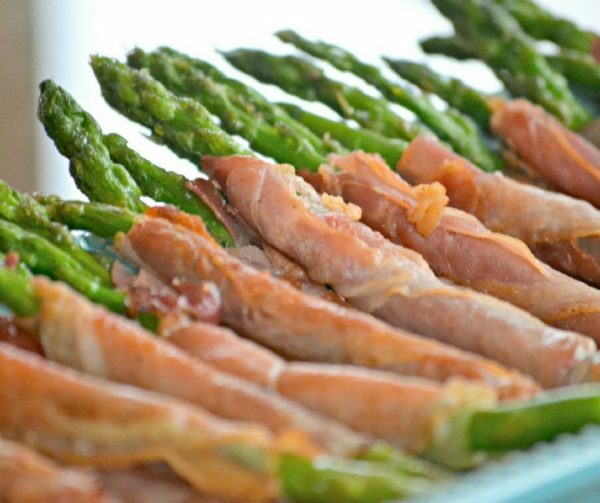 Serve these beautiful asparagus wraps with eggs for breakfast,, as a side for lunch or dinner, or as festive appetizer at your next holiday party. Cut off ends of Asparagus spear approximately 1-inch at bottoms. Slice prosciutto pieces in half lengthwise. Lay one prosciutto strip on cutting board at a 45 degree angle. Place 1 asparagus spear perpendicular to it. Wrap bottom end of prosciutto over the asparagus and holding the meat tight, start rolling the asparagus up until the meat comes to the other end. Repeat until asparagus and or meat are gone. In large frying pan, melt the butter on medium heat. Place wrapped asparagus in a single row and saute on each side 1-2 minutes or until lightly browned. Best served warm but they can be served as a cold appetizer too.